Raymond Dalio (born August 8, 1949) is an American billionaire investor, hedge fund manager, and philanthropist. Dalio is the founder of investment firm Bridgewater Associates, one of the world's largest hedge funds. Bloomberg ranked him as the world's 79th wealthiest person in January 2019. Raymond Dalio was born in the Jackson Heights neighborhood of New York City's Queens borough. He is the son of a jazz musician, Marino Dallolio (1911–2002), who "played the clarinet and saxophone at Manhattan jazz clubs such as the Copacabana," and Ann, a homemaker. He is of Italian descent. Dalio began investing at age 12 when he bought shares of Northeast Airlines for $300 and tripled his investment after the airline merged with another company. Dalio received a bachelor's degree in finance from Long Island University (CW Post) and an MBA from Harvard Business School in 1973. After completing his education, Dalio worked on the floor of the New York Stock Exchange and traded commodity futures. He later worked as the Director of Commodities at Dominick & Dominick LLC. In 1974 he became a futures trader and broker at Shearson Hayden Stone. In 1975 he founded investment management firm Bridgewater Associates out of his apartment. The firm opened an office in Westport, Connecticut in 1981, and became the world's largest hedge fund in 2005. As of October 2017 it had $160 billion in assets under management. 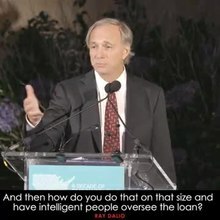 In 2007 Bridgewater predicted the global financial crisis, and in 2008 Dalio published an essay, "How the Economic Machine Works; A Template for Understanding What is Happening Now", explaining his model for the crisis. In 2011 he self-published a 123-page volume, "Principles", that outlines his philosophy of investment and corporate management based on a lifetime of observation, analysis and practical application through his hedge fund. In 2012 Dalio appeared on the annual Time 100 list of the 100 most influential people in the world. In 2011 and 2012 Bloomberg Markets listed him as one of the 50 Most Influential people. Institutional Investor's Alpha ranked him No. 2 on their 2012 Rich List. In 2017 Simon & Schuster published Principles: Life & Work. The book was a New York Times #1 best-seller and Amazon’s #1 business book of 2017. Dalio discusses his background as a backdrop for his takeaways about life and work. He has announced that he will write a second volume, Principles: Economics & Investing. Dalio has said that he could continue improving his returns by solidifying recurring lessons into "principles." Dalio was co-CEO of Bridgewater for 10 months before announcing in March 2017 that he would step down as part of a company-wide shake-up by April 15. The company had been in a seven-year management and equity transition to find a replacement. Jon Rubinstein, co-CEO of the fund, was announced to step down with Dalio, but would retain an advisory role. On April 7, 2019, Dalio said on 60 Minutes that income inequality in the United States was a national emergency requiring reform. Dalio resides with his wife Barbara, daughter of Gertrude Vanderbilt Whitney, (married in 1976/77) in Greenwich, Connecticut, and is known to practice the Transcendental Meditation technique. They have four sons, Devon, Paul, Matthew, and Mark. Devon, their eldest son (born March 26, 1978), was named after North Devon cattle because Ray was deeply involved in cattle futures at the time. Second son Paul Dalio is a film director. Matthew Ace "Matt" Dalio, their third son, is founder and chairman of the China Care Foundation, a non-profit that seeks to help Chinese orphans, and co-founder and CEO of Endless Mobile, Inc., a computer operating system company. Their youngest son Mark Dalio is a wildlife filmmaker. Dalio giving a speech on philanthropy. According to Forbes Magazine, Dalio's net worth was $18.6 billion as of January 2019. In 2018 Dalio was ranked 25th in the Forbes 400 list. In 2014 Dalio reportedly earned $1.1 billion, including a share of his firm's management and performance fees, cash compensation and stock and option awards. In April 2011 Dalio and his wife joined Bill Gates and Warren Buffett's Giving Pledge, vowing to donate more than half his fortune to charitable causes within his lifetime. Through the Dalio Foundation, he has directed millions in donations to the David Lynch Foundation, which promotes and sponsors research on Transcendental Meditation. The Dalio Foundation has also contributed to the National Philanthropic Trust, to polio eradication projects, and to NewYork–Presbyterian Hospital. The foundation has also supported the Fund for Teachers, an initiative that supports professional learning fellowships for teachers. The Dalio Foundation was part of a group of foundations supporting the 2018 launch of TED's Audacious Project, an initiative to fund social entrepreneurs working to solve global issues. In March 2019 Dalio was named one of the highest-earning hedge fund managers and traders by Forbes. In 2018 Dalio and Mike Bloomberg committed $185 million to protect the oceans. Principles was listed among the 13 Best Business Books of 2017 by CNBC. ^ "Bloomberg Billionaire Index". Retrieved 18 April 2018. ^ "Forbes profile: Ray Dalio". Forbes.com. Retrieved 10 April 2019. ^ "The Rise of Dalio Philanthropy: A Case Study of the New Mega-Giving". Inside Philanthropy. Retrieved April 22, 2017. ^ "Ray Dalio, Founder of World's Largest Hedge Fund: Weak Economy Makes Second Adolf Hitler More Likely". Algemeiner. Retrieved March 19, 2013. ^ "Bloomberg Billionaires Index - Ray Dalio". Bloomberg.com. Retrieved 2019-01-30. ^ a b c Wright, Robin (September 15, 2008). "Mastering the Machine". The New Yorker. Retrieved June 8, 2017. ^ a b "The Palm Beach Post from West Palm Beach, Florida on September 4, 2002 · Page 38". Newspapers.com. September 4, 2002. Retrieved June 8, 2017. ^ a b Cometto, Maria Teresa. "Ray Dalio, il libretto rosso dello speculatore che attacca l'Italia". Corriere della Sera (in Italian). Retrieved 2018-04-12. ^ "Bridgewater's Ray Dalio on the 'Principles' of Tough Love - Alumni - Harvard Business School". www.alumni.hbs.edu. Retrieved 2019-01-30. ^ a b c "The head of the world's largest hedge fund explains how he learned to invest". Business Insider. Retrieved April 12, 2017. ^ Goldstein, Matthew (2017-10-16). "Small Endowments May Get to Invest in Bridgewater Associates". The New York Times. ISSN 0362-4331. Retrieved 2018-04-12. ^ Cassidy, John (July 25, 2011). "Mastering the Machine How Ray Dalio built the world's richest and strangest hedge fund". The New Yorker. Retrieved December 18, 2013. ^ Ovide, Shira (October 22, 2010). "More on Bridgewater's Ray Dalio, Wall Street's Oddest Duck". The Wall Street Journal. Retrieved December 4, 2013. ^ Rosenthal, Norman E. (2013). "The Gift of Adversity". The Gift of Adversity. Penguin Group. pp. Chapter 41. Retrieved December 4, 2013. ^ Volcker, Paul (April 18, 2012). "The 100 Most Influential People in the World". Time. Retrieved August 15, 2012. ^ Taub, Steven (April 15, 2013). "The Rich List". Institutional Investor's Alpha. Retrieved April 16, 2013. ^ a b Cox, Jeff (2017-03-01). "Bridgewater's Ray Dalio to step down at Co-CEO on April 15". Retrieved 2017-06-23. ^ Cox, Jeff (2017-03-01). "Bridgewater's Ray Dalio stepping down from co-CEO role in company shakeup". CNBC. Retrieved 2017-12-28. ^ Mark Niquette (April 7, 2019). "Dalio Says Capitalism's Income Inequality Is National Emergency". Bloomberg.com. Retrieved April 9, 2019. ^ Bill Whitaker (April 7, 2019). 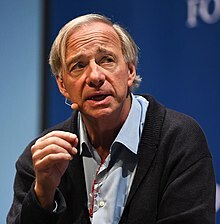 "Ray Dalio says wealth inequality is a national emergency; The founder of the most successful hedge fund in the world says capitalism needs to be reformed and that the American dream is lost". cbsnews.com. Retrieved April 9, 2019. ^ Opalesque (January 8, 2008). "Ray Dalio's winning strategy". ^ Ray Dalio, Principles, Simon & Schuster, 2017, pp.24-25. ^ Finance (March 19, 2012). "Ray Dalio's Son Is An Entertainment Producer, And He's Directing A Movie About Maniac Depressives With Spike Lee's Support". Business Insider. Retrieved June 2, 2017. ^ "Top 10 Hedge Fund Guru's children: The Privileged Lives of Hedge Fund Heirs". Alpha Banker. June 25, 2014. Retrieved June 8, 2017. ^ "About Us | Endless Computers". Endlessos.com. Retrieved 2017-10-19. ^ "Ray Dalio". Forbes. Retrieved 2019-01-30. ^ "Forbes 400 2018". Forbes. Retrieved 2019-04-03. ^ H. Kent Baker; Greg Filbeck (26 July 2017). Hedge Funds: Structure, Strategies, and Performance. Oxford University Press. pp. 52–. ISBN 978-0-19-060739-5. ^ "Bridgewater's Dalio Joins Giving Pledge - NY Times". NY Times. April 28, 2011. Retrieved April 29, 2015. ^ "Hedge Fund Billionaire Ray Dalio Gives Big for David Lynch". www.institutionalinvestor.com. Retrieved 2017-08-23. ^ Vardi, Nathan. "Hedge Fund Billionaire Ray Dalio Steps Up Foundation Giving". Forbes. Retrieved 2018-04-09. ^ "9 Stamford Educators Receive Grants For U.S. & Foreign Studies". Stamford, CT Patch. 2018-04-09. Retrieved 2018-04-10. ^ Nicosia, Mareesa. "TED Launches The Audacious Project, Awarding $250M to New Crop of Social Entrepreneurs". Retrieved 2018-04-10. ^ Dalio, Ray (January 13, 2018). "A Template for Understanding What's Going On" (PDF). ^ Stevenson, Alexandra; Goldstein, Matthew (September 8, 2017). "Bridgewater's Ray Dalio Spreads His Gospel of 'Radical Transparency'". The New York Times. ISSN 0362-4331. ^ Montag, Ali (2018-09-14). "Billionaire Ray Dalio remembers the moment he saw the financial crisis coming: 'This is the big one'". CNBC. Retrieved 2018-09-17. ^ Clifford, Catherine (2017-12-27). "13 of the best business books of 2017". CNBC. Retrieved 2017-12-28. "Ray Dalio Biography and Interview". www.achievement.org. American Academy of Achievement. October 2012.